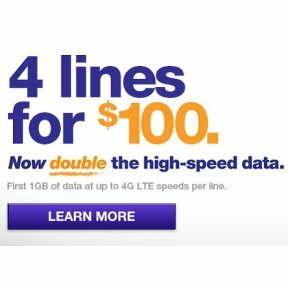 T-Mobile's MetroPCS brand has quietly re-enabled its four lines for $100 promotion for an unspecified "limited time". The promo works with MetroPCS' $40/month unlimited plan. Two lines are $70 per month, three lines are $90 per month, and four lines are $100 per month. Plan prices include all taxes and fees, however MetroPCS stores typically charge an activation fee of between $15 and $25 per line. Each line gets unlimited talk and messaging and 1 GB of high speed data. After the high speed data is used up, unlimited data throttled to 128 Kbps is available for the remainder of the plan month. The promotion is only available at MetroPCS stores, not online and it applies to new GSM lines of service only. You can buy new phones or use your own compatible phones (any T-Mobile phone and most unlocked GSM phones from other carriers). Click here to find a MetroPCS store. Only if you buy online, but then there is a restocking fee for returns. Activation fees are how brick and morters pay the bills. I found their customer service was pretty decent when I had to call them. I was able to understand them and they were polite are respectful. I had to call them 3 times and was on hold from 2-5 minutes each time. Not too bad for prepaid. That's one thing to remember when using prepaid: limited resources compared to postpaid services. it is not $100 for 5 lines. it is $100 saving for 5 lines. Actual cost for 5 lines is much higher than $100. No, it really is 5 lines for $100. A single line is $40.00. 5 lines x $40 = $200 - $100 Group Save Discount = $100. Tried T-mo for 2 months here in San Jose and it was terrible. Calls were being dropped all over the place. I was however able to get 4G LTE speeds inside the Great Mall where Verizons network would start to crawl. No competitive enough in light of the current promotions from Cricket. are there any BYOP providers that offer a deal like this with no activation fees? Cricket has five lines for $100 with no activation fee if you activate online. "I've heard on the 19th Go Phone will be getting unlimited"
Is this false? Do you know anything about this? I think it's likely to be true. See: GoPhone $60 Plan Getting Unlimited Data? Thanks for answering. I missed that when it came out. I noticed also that even with the new plans for tomorrow, the $45 Walmart Gophone unlim talk/text, 1 GB data for $45 looks like a real good deal. Is there a sidebar item for Gophone, or am I missing it? Or is it all folded into ATT ...which would actually make sense? The AT&T sidebar category is actually AT&T GoPhone. Missing from the above comparison is that the data coverage of T-Mobile is much much less than that of ATT. The fastest LTE on the planet won't help you if you are in the 70% of the country not covered by TMobile. The much much better coverage ATT has causes me to give them more consideration than TMo. Missing from this post and the earlier, misleading coverage criticism is that the vast majority of people have T-Mobile coverage almost all of the time. 250M on LTE now, and 280+M on HSPA+. Unlike you, they should not have to give up all of the MetroPCS advantages and suffer all the Cricket issues to get so little in return. Nothing missing. The difference is, I am not trying to sell any of these systems, so there is no need for me to to misleading and vague marketing terms like "covers most people" to make up for poor coverage. These phones are supposed to be mobile, after all, and need to do more than cover "people" who sit still. ATT and thus Cricket (and GoPhone) cover about 70% of the US in talk, text, and data. TMobile has this coverage for only 30% of the country... half that of what TMobile (and its divisions and related MVNO's have). Whatever Cricket's issues are, they have significantly better data coverage than TMobile does. For those who plan on using or use data, this is undeniably an important and substantive difference. Because for the vast majority of the country, when it comes to data coverage the "Cricket issues" pale in comparison to simply having no TMobile data coverage whatsoever. Thus, for most of the US, TMobile means 0M of LTE, not 250M. If you plan on just using talk and text, when yes, the T-Mobile side comes across very very good.